(CNN) — A winter commute can seem far easier when the office is a Caribbean beach complete with lapping waves, a lilting calypso soundtrack, and no boss to bother you. The ability of virtual reality to transform worlds is not limited to gaming, and as excitement builds ahead of the launch of Oculus Rift, creative applications are emerging that promise to transform the workplace. These are just a few of the ideas that will turn ‘business as usual’ upside down. If a sports car catches your eye online, rather than admiring a picture or video, you could take it for a spin then and there and instantly discover if it’s right for you. Businesses are certainly keen to grasp the chance of selling their wares in such immersive style. The same concept allows for virtual tours; an estate agent can guide a potential buyer through a new home, pointing out its best features in real time, or tour companies could offer a taster of a holiday complete with sharks and skydiving. When BAE systems are putting together a state-of-the-art submarine, they no longer develop it through scale models, they use virtual headsets to play with 3D models. Any design flaws are picked up early in the process and avoid becoming expensive to correct later. Increased processing power has allowed for real time rendering that allows for constant, low-cost refinement. While just a handful of elite firms currently utilize the process, growth is anticipated among smaller businesses as the technology becomes more widely available. 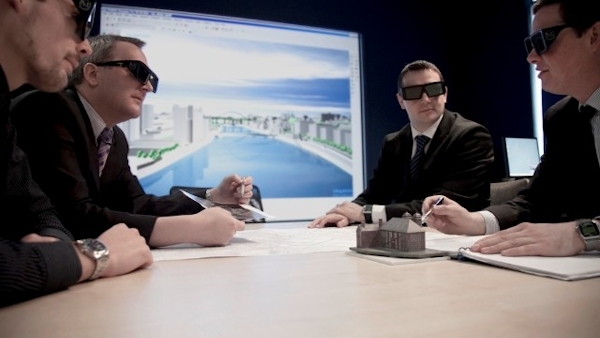 From surgery to building sites, virtual reality allows employers to test their workers in a range of detailed and realistic environments, without unnecessary risk. “If you’re training to work on an oil rig, it’s much safer to have that experience in the virtual world rather than the North Sea, as well as saving you time and materials” says Jason Collins, marketing director of visualization specialists ZeroLight. The concept can also be used to train whole groups, and can also be applied to the classroom to bridge physical distance between teacher and student. The great promise of Facebook’s multi-billion acquisition of Oculus was that a whole new dimension of social networking could be built on face time, meeting and interacting on a virtual plain, which could be adapted to the most convivial of settings — taking a boardroom to the beach. The potential is being explored through virtual conferences in which the participants dial in with their physical forms. This can allow people to be far closer connected, says Maria Korolov, editor of Hypergrid Business magazine. But Korolov adds that conferences with too many people are still afflicted with a lag that can induce nausea, and further technology is required to make the experience seamless. For the wolves of Wall Street, an Oculus visualization allows traders to explore their stock portfolio as a 3D city, complete with colored indicators of performance and skyscrapers that go up and down with market fluctuations. An experiment, say creators Fidelity Labs, but an intoxicating one backed by the Harvard Innovation Lab, and certain to inspire imitators.